TORONTO -- Francois Ricard's run of poking fun at the prime minister about Canada's impending legalization of recreational cannabis may soon come to an end in Quebec even if it thrives in the rest of the country. His Just-in Canada line of products depicting Justin Trudeau riding a giant joint or flying high above Parliament Hill will be outlawed on Oct. 17 according to a new provincial law that prevents retailers from selling any items that include the cannabis leaf. "At this point my only option in Quebec is to hide the joint or the leaf image and put 'censored' over it," he said in an interview. The head of the 75-year-old gift and souvenir supplier linked up with a local artist in an attempt to cash in on what Ricard expects will be growing demand for cannabis-related paraphernalia as legalization makes marijuana use more mainstream. The Quebec law will almost certainly face a constitutional challenge over freedom of expression protected by the Charter of Rights and Freedoms, says Mylany David, a lawyer who heads a working committee on cannabis at the Langlois law firm. The new Quebec government has promised to raise the age for using cannabis to 21 from 18 and prevent public consumption, but has not indicated if it will make changes to a law prohibiting sales of T-shirts and other items depicting the marijuana leaf. David said she doesn't see how selling T-shirts with a marijuana leaf could become illegal even though consuming the drug itself will be legalized. "It's a leaf that's existed for thousands of years and it does not belong to the government of Quebec," she said. "It's not property rights of the government of Quebec to prohibit the use of it so it will be challenged because it may limit the freedom of expression -- a fundamental charter right." 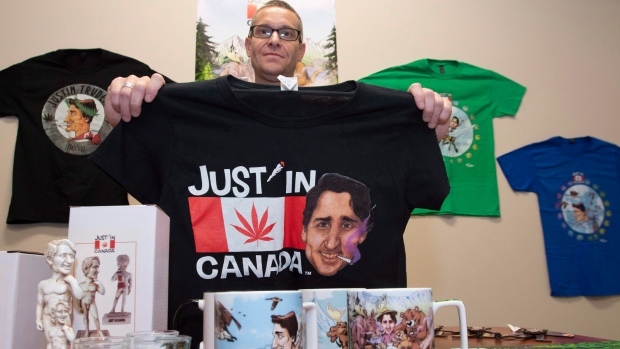 In the rest of Canada, sales of cannabis-monikered T-shirts, mugs and jewelry will continue and likely increase, industry observers say. Cannabis symbolism isn't just restricted to goods sold in souvenir or head shops, says Rebecca Brown, founder of Crowns Creative, a Toronto-based advertising agency focused on the cannabis industry. It is being embraced in fashion circles, with an array of pricey clothing and jewelry that show off the cannabis leaf. "It's this elevation of cannabis symbolism which I think is super cool and I guess it'll be interesting to see in Canada how will that play out." Brown believes cannabis symbolism will grow as has been the case during other big cultural shifts that captured people's imaginations, such as the space race many decades ago. "There will be more depicted and different kinds of depiction of cannabis in many different ways as it becomes more mainstream," she said. "Some of it will be parody and some of it will be more elevated like fashion." The industry has been spending heavily on non-cannabis products that don't face the same restrictions as cannabis and accessories. Producers are all ordering swag to promote their brands, said Mitch Freed, executive vice-president of sales and strategy for promotional merchandise firm Genumark. "They're marketing like crazy," he said in an interview. "These are billion-dollar companies that are marketing themselves very similarly to other billion-dollar companies in our country." Freed expects branding will increase following legalization but he declined to estimate how much spending could be added to the $2-billion Canadian promotional product sector. Merchandise has always been an important part of Canopy Growth Ltd. dating back to its origins as a supplier of medical marijuana, said David Bigioni, chief commercial officer, recreational cannabis. But instead of T-shirt giveaways, the company is focusing efforts on raising awareness of its Tweed brands, he said. "You're trying to enhance and complete what consumers need to fully realize their cannabis experience," Bigioni says of grinders, vaporizers and other accessories. The company will also sell unique products along with shirts, vests, socks and other materials outside of Quebec that customers would want to wear, but with a modern twist. Branding is an important way to attract adult consumers to the new legal marketplace from the illicit trade, says Allan Rewak, executive director of the industry association Cannabis Canada Council. But Rewak adds that his members won't engage in general branding that appeals to youth, is lifestyle branding or uses celebrity endorsements -- all of which are illegal under the federal rules. "You'll see some T-shirts at visitors centres and stuff like that but this will not be beer."